I didn’t get much done with the home repairs this week. There has been a single project that consumed the majority of my time. When we moved in there was a good size bird feeder in the back yard. During the ice storms last winter a tree limb fell on it and snapped it in half, leaving a broken 4×4 sticking out of the ground and a cement base. There is also cable box in our backyard behind a bush and I wanted to just move this cement platform 15 feet or so to be next to it. 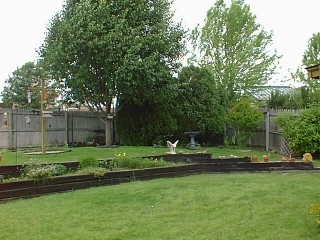 There are already smaller stepping stones leading to it, so it would have looked ok there and stopped grass and weeds from growing up around the cable box. Now I knew this thing would be heavy, but I wasn’t sure how heavy. 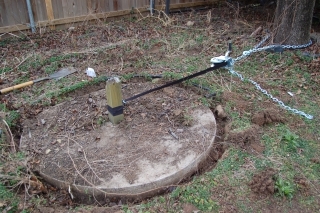 My plan was to dig up around it, use a shovel to tip it on it’s side, roll it over to the cable box and cut off the 4×4 sticking out of it. Figured it would take an hour or so. After digging up the dirt around it, I discovered it was a lot thicker than I expected. I thought it was about a 1″ thick prefabricated disk. Turned out it’s poured concrete, 5″ thick. I tried to pry it up with the shovel anyways but it was clear the shovel was going to loose that battle. I had to come up with another plan now, so I got to wondering, “Exactly how heavy is this thing?” I first looked up how much concrete weighs and it varies base on the mix, but it’s roughly 2,700 lbs per cubic yard. There are 27 cubic feet in a cubic yard, so about 100 lbs per cubic foot. Then multiple that by 5/12 of a foot for the thickness and I came up with 8.18 cubic feet. So this sucker is about 818 lbs. Seems a little overkill for holding up a bird feeder if you ask me.. Anyways, at this point I’m thinking forget it, I’ll just break it up and throw it away. But.. I’m guessing that’s not quite as easy as it sounds either and I doubt the garbage man was going to take 800 lbs of concrete. I wasn’t ready to give up yet. I figured I just need to tip this thing on it’s side and I can probably roll it from there. High school physics, don’t fail me now! 🙂 I tried a lever already and that didn’t work out too well. I didn’t have anything tougher than the shovel to try again with. I thought about a car jack, but I couldn’t get it under the block to start with and I figured it would just sink in to the mud. The only other two options I could remember were a pulley and an Archimedes’ screw. It didn’t look like Archimedes was going to be any help so I figured a pulley was my last hope. I didn’t have anything over this block to hang a pulley from, but there was a tree to the side of it, so I figured I could turn the whole thing sideways and use a pulley to get this block tipped onto it’s side. I went down to Wal-Mart to go pulley shopping. Once I got there I quickly discovered the best pulleys and ropes money can buy (at Wal-Mart) were only rated up to 500-600 pounds. There went that option. I found a towing chain rated up to 5,000 pounds though so I grabbed it and it gave me the idea to head over to automotive to see if they had any better options there. I found a winch! Perfect! Only $30 too! It’s really designed for pulling your boat onto a trailer, but I’ll make due. It was rated to 1500 lbs, so I found some hooks that were also rated for that so I could attach the winch to the chain and wrap the chain around the tree. The plan was coming together. I went home and got the whole contraption set up and started cranking. Everything I had was rated for 1,500 lbs or more which should be more than enough, but it dawned on me, I’m not really sure what the tree I was hooking this all up to was rated for. I was somewhat concerned about bringing the rest of the tree down on top of me, but figured the 4″ thick wood post should break before the foot thick tree did. Even with the winch it was proving to be quite difficult to crank and the belt started showing some signs of wear. A crank or two later, the fastener that was holding the whole thing together broke. The threads stripped free and it bent itself open, more accurately. 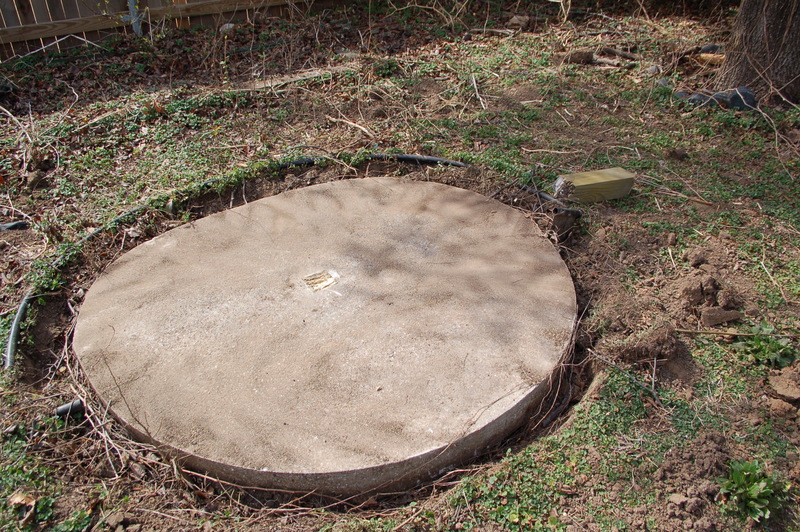 I started questioning exactly how much this concrete pad really weighed again. I also started having serious doubts that I would be able to roll this thing even if I did get it on it’s side. Frustrated and tired, I thought to myself “You know what would look good there? A bird bath!”. I somehow managed to get Jeanette to go along and we spent the remainder of the week looking for a normal concrete or stone looking bird bath. Apparently bright red and blue ceramic is the style now and that’s all stores carry. We tried Garden Ridge, Hobby Lobby, Home Depot, Wal-Mart, Old Time Pottery and Atwoods and none of them had normal bird baths. We finally found one at Lowes. 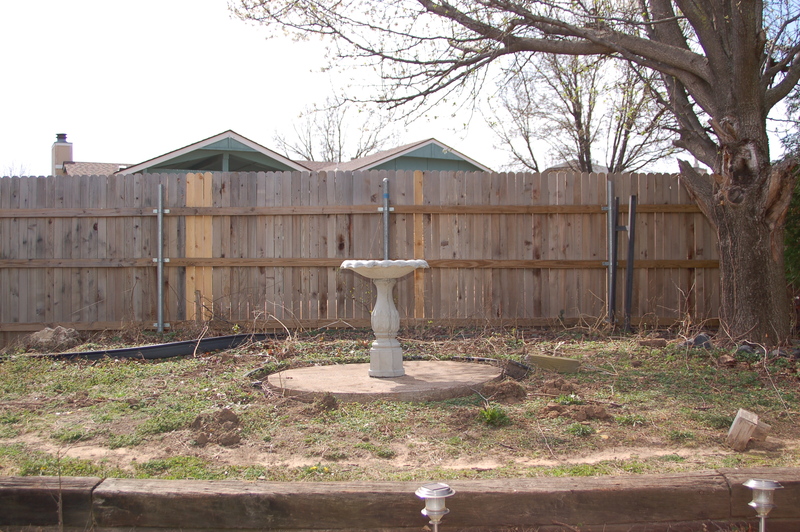 I sawed off the wood post to be even with the concrete base and put the bird bath out there. I added some concreate glue to keep the dog from knocking it over on herself. Finally that project is done! Although, I may plant some flowers around the base. After feeling how heavy that bird bath was, I’m really glad I didn’t get any further in my attempts to move the base. This entry was posted in Jeremy and tagged house, repairs on March 11, 2009 by Jeremy Zongker.